The ArborLoo is a simple, low cost toilet that is easy to build and maintain and is relatively free of odors and flies. A toilet house which surrounds the slab. Flies and odors are controlled by regularly adding soil, wood ash and leaves into the shallow pit. By adding the soil, ash, and leaves, the excreta in the pit turns into compost faster. When the pit is nearly full, soil is added to cover the compost and a tree is planted in the soil. This can later bear fruit or supply timber for fuel or building. 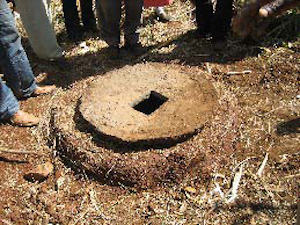 Each ArborLoo toilet can be locally constructed for $5-8 USD. Most of the rural population of Ethiopia lacks access to safe and reliable toilets. The ArborLoo, together with a supply of clean water and regular hand washing, can do much to improve personal health and wellbeing, while also promoting environmental sustainability.